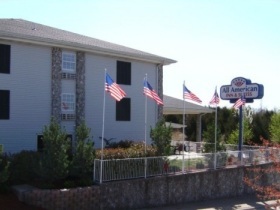 All American Inn & Suites in Branson features spacious rooms and suites, all furnished for your maximum comfort and pleasure. The property is entirely free of smoke and pets and includes special amenities like extra plush beds and bedding. Every room has a 32-inch LCD high definition television, complimentary WiFi, microwave, refrigerator, electronic door lock, and a desk with ergonomic chair. All American Inn & Suites has weather-friendly interior corridors, a meeting space, an outdoor pool with sunbathing deck, and extensive hot breakfast options that include biscuits and gravy and waffles, as well as an assortment of cold items. And for those afternoon munchies, you’ll find delicious Otis Spunkmeyer cookies, coffee, and tea available in the breakfast area. All American Inn & Suites is a group-friendly property and perfectly suited for special occasions. You’ll find king honeymoon suites with a Jacuzzi tub and spacious two-room family suites, and all guest rooms are furnished with Serta pillow top mattresses and premium pillows. Handicap accessible rooms are also available, including a queen with roll-in shower, and a family suite equipped with grab bars. Spend your time in Branson enjoying all the incredible shows and attractions, and let the friendly folks at the All American Inn & Suites worry about keeping you comfortable!